I am not sure what the temperature reached yesterday but it was above 30C. I stood in the heat fighting with acrylic paint that was drying incredibly quickly and tried to focus on what I was doing. I was in a lets just get this done mood and maybe that was a good thing. 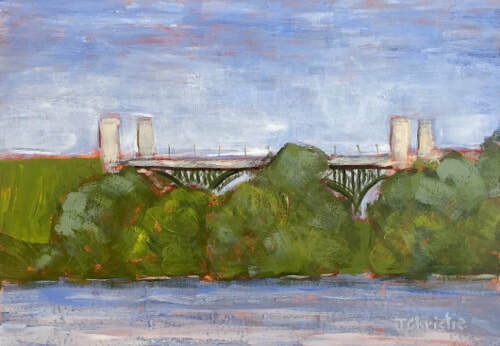 I have tried painting the Mcquesten bridge many times and failed miserably every one. Only time will tell but I kind of like this painting.